Thank you for supporting Dark Sky Defenders, a 501c3 educational non-profit organization supporting astronomy education as well as dark sky preservation and protection. Your TAX-DEDUCTIBLE contribution goes towards preserving dark skies for future generations, and supports public outreach and science education. Those wishing to join the Defenders may select their tax-deductible donation amount from the options below. Your membership becomes active the moment donations are received. All credit cards and bank transfers are processed securely through PayPal. ​Please complete all fields on the donation form or your ​membership may not be processed in a timely manner. 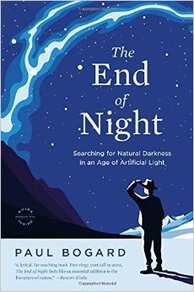 All contributions of $50 or greater will receive a copy of Paul Bogard's The End Of Night. ​Be sure to include your mailing address to receive a copy of the book. Special thanks to Friends of the Goldendale Library for their generous donation of books.